Always engage a registered electrical contractor. If you are planning to have some electrical installation work done, you must engage a registered electrical contractor. They will dispatch a licensed and qualified electrician to do the work to the required standards. 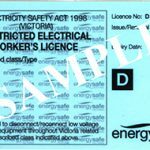 There are around 55,000 electrical professionals licensed or registered in Victoria by ESV. Use our Find a tradie listing to find your local registered electrical contractor (REC), or search the Yellow Pages or Google. 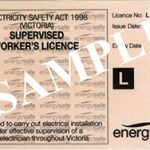 Choose tradespersons or contractors who list their qualifications and areas of expertise as part of their advertisement or on their website, or contact them and ask if they are a licensed or registered to undertake electrical work in Victoria. If they are, they will have an identification card endorsing them to carry out electrical work. 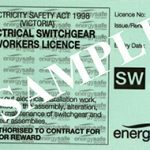 Always ask to see a tradesperson’s licence – it is your guarantee they are qualified and competent to undertake your electrical work and it provides you with avenues for recourse if something goes wrong. Whenever a licensed electrician completes any electrical installation work, they must provide a Certificate of Electrical Safety (COES). COES are only available from qualified electrical workers who are registered or licensed by ESV. As such, a certificate is assurance the work has been done by an appropriately qualified person and carried out in accordance with the high standards demanded by the ESV. The work is also subject to audit to ensure it complies with the standards. A prescribed certificate is for all major electrical wiring work in all types of premises. In a domestic property this covers all work done on wiring and equipment where the electricity cannot be switched off. This generally means work on wires up to the switchboard and may include the wiring from the street to the house/building and the electricity meter. 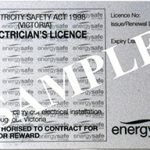 A non-prescribed certificate is for all minor electrical wiring work in all types of premises. In a domestic property this covers all work done on wiring where the electricity can be switched off at the switchboard. For example, installation or maintenance of safety switches, circuit breakers, power points, non-plug-in electrical equipment or lighting points within the house. Non-prescribed work does not require inspection, but ESV may arrange one with your agreement for audit purposes. 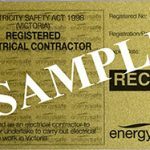 If your electrical contractor does not show you his/her licence or does not issue you with a certificate of electrical safety, contact ESV immediately. Refer to Electrical safety at home or read our brochure on Choosing an electrical person. 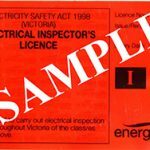 If you have any queries in relation to electrical safety around your property or about choosing and using an electrical tradesperson, please contact ESV on 03 9203 9700 or by email on info@energysafe.vic.gov.au.